"During holidays, [Norman Vincent] Peale once suggested, you should make ‘a deliberate effort to speak hopefully about everything.’"
Our in-house psychologist - Dr. Frank Murtha – recently asked me, "You’ve got all this data on emotions so tell me, what’s the Happiest Day of the year? And as a matter of fact, what’s the Angriest Day? And the Most Pessimistic Day?" I had no idea. Based on work by Aleksander Fafula, our data genius, we know the happiest month is January (when we control for holiday greetings) and the Angriest month is September. But days? We hadn’t thought to look. 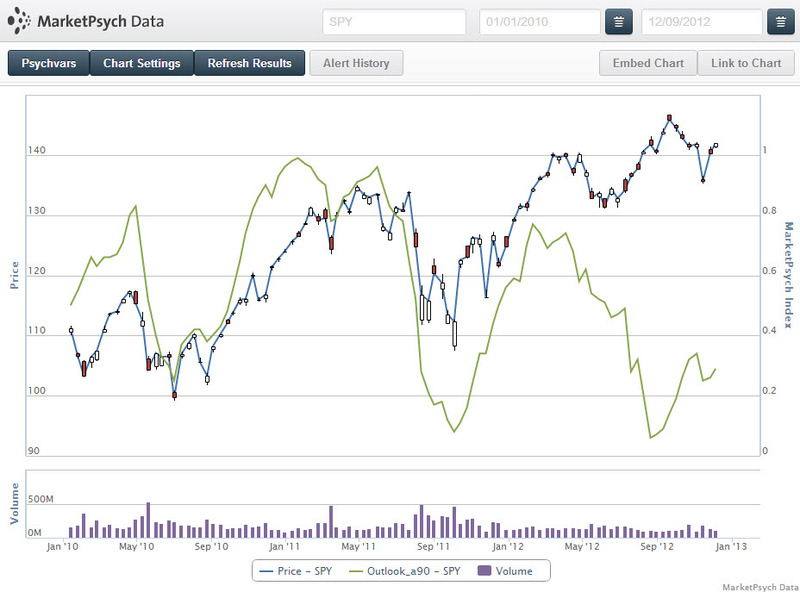 To investigate, we ran an analysis using the Thomson Reuters MarketPsych Indices social media-based sentiment indices for the SP 500. These indices cover every year from 1998 through November 2012. What did we find? First of all, and fortunately, the next few weeks don’t contain extremely Angry or Pessimistic days. The next 3 weeks do, however, contain the Happiest and the Most Optimistic Days. Norman Vincent Peale's advice has possibly been taken to heart, but perhaps more for unconscious biological reasons (seasonal neurochemical and hormonal shifts) rather than people consciously taking Peale's words to heart (the advice itself is useless). For specific days, the 23rd of December is the Most Joyful (today!!! ), and January 9th is the Most Optimistic. Note that market holidays are excluded from the analysis. So… we hope you have been enjoying Financial Happiness Day today! In honor of Financial Happiness Day (and the Fiscal Cliff), check out Dr. Murtha’s zany video spoofing the struggles of financial advisors around the fiscal cliff with our old friends, Bob (an individual investor) and his financial advisor Helen. Chinese investors are especially happy today. The Chinese indexes have gone vertical in the past 3 weeks (up 10%). And while stock market bottoming is usually a long process, China’s market seems to have decided that the coast is clear. "China?" you say, "but that market is full of corrupt and obscure accounting practices, banks stuffed with non-performingpolitically-driven loans, and state-owned companies." Yes, those are all problems for Chinese equities, but in today’s newsletter we’ll also look at some positives for China, including sentiment indicators such as higher Fear levels than peers. And we’ll look for stocks that are good long term buys in China. China’s economic growth rate has been nothing short of spectacular. While in 1963 China was the 12th poorest country in the world per capita, lying between Somalia and Burundi in the rankings, by 2012 China is in the middle of the economic pile. China emerged from a centuries-long slump, but it wasn’t without the exercise of State power. While many State programs were epic failures (e.g., the Great Leap Forward), many more have been successful (e.g., the development of high speed railways and transportation networks and the most prolific industrial and manufacturing base on the planet). I bring up State power because in China the State has directed many immensely beneficial projects, and there are indications that the State may be now serious about developing the equity markets to international standards. In our quantitative studies with Optimism and Equity sectors and industries, we find that changes in Optimism are usually more significant in their impact than the net level. In the example above, the decline in Chinese Optimism reflects the decline in Chinese share prices. As we continue to study sentiment indices and national economic development and stock market returns, we will explain more of what our findings mean for the future. In another study we found that Fear about China is quite high, second to the Eurozone of the nations and regions depicted (see chart below). That is, there is significant anxiety expressed in English language social media about China. Despite overall Optimism about China’s future, this is tempered by Fear that China’s rise comes with risks. When we analyze currency price forecasts, we see that the consensus for China’s Yuan is that it will rise, although the consensus has begun to unravel in the past year (see chart below, note that the colors denoting each country changed). The Yuan revaluation consensus is falling as it becomes clear that Chinese inflation is reducing some industrial competitive advantages, and money is moving out of China, as wealthy investors and successful companies sell Yuan to buy overseas assets. What does the consensus mean for us? First, when we’ve had a long period of extreme consensus in the markets, and the consensus begins to shift, it takes time for investors to readjust their expectations and for the new reality is reflected in prices. Being contrarian by nature, I tend to believe that the consensus is priced in. But being an empirical being, I’ve tried to prove this statistically. 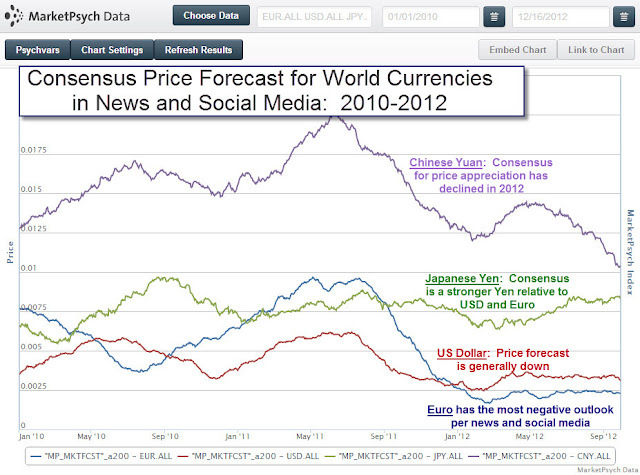 We’ve done some quick studies on whether future expectations can predict prices. We find that large short-term changes in future expectations have a lagged impact and do often precede price changes. This finding is only true for social media. News tends to report the safe opinion, which is usually an extrapolation of what already happened, while social media is more useful in our research. Since 2007 the Chinese stock market has been in a slump. We predicted as far back as 2000 that there would be a massive Buy on the Rumor, Sell on the News pattern around the Beijing Olympics with Chinese indexes rising into summer 2008 and then falling after the Games were held. Our timing was off (by a year! ), but the general pattern held. The markets recently hit three-year lows (before rebounding 10% the first two weeks of December). The China Securities Regulatory Commission (CSRC) indicated on November 30, 2012 that a stable stock market is in the national interest. And we know from recent history that when the Chinese government sets a goal, it usually achieves it. There is also some momentum behind reforms of the Chinese financial markets. We’re seeing historically low Chinese stock valuations (P/E ratios), the emergence of Chinese financial products such as mutual funds, Chinese real estate prices plateauing, and some world-changing companies emerging out of China. Is it time to get back into Chinese stocks? Ah, but of course there is always a contrary opinion. Many local and international investors are worried about the high levels of state ownership of shares (as this excellent article explains). There is an unresolved conflict between U.S. accounting rules and the requirement of U.S.-listed State-owned Chinese ADRs to reveal their internal numbers (which are State secrets per Chinese law). And don’t forget that many U.S.-listed Chinese stocks had fraudulent accounting detected by our social media Alerts in our June 2011 newsletter. Bank stocks have low P/Es due to an accumulation of non-performing politically-motivated loans, and when they are removed from the Shanghai index, P/E ratios are actually fairly high – above 20. Given the weight of the evidence, I think China is forming a bottom around 2,000, and from here we’re likely to see positive reforms to root our fraud and fix a broken equities market. So is it time to buy? As in every situation, one must look carefully for the companies of the future and select carefully. Trading recap from last newsletter: Our two trades from our prior newsletter both did well, despite the S&P 500 falling slightly. The one-week buys on Intel (INTC) and Freeport McMoran (FCX) were profitable as INTC rose 2% and FCX rose 5% on the week. Week ahead: Our trades this week are low conviction. We’re seeing a one week buy on Decker Outdoors (DECK), maker of Ugg boots, which haven’t been selling well. The stock has sold off dramatically on fear that the Ugg fad has passed, which appears to be a short term over-reaction. We see a one-week short on the Chinese ADR Trina Solar (TSL). There is substantial liking of this stock, which is short-term concerning and indicates a sell. (Note the Disclaimer). Regarding China, I'm going to be wishy-washy. Things change fast in China, and I'm not a fundamental nor a Chinese analyst. Using sentiment scores it is clear that some U.S.-listed Chinese ADRs such as Netease (NTES) and Renren (RENN) have sold off on delisting and fraud fears, and now may be a good time to consider entering on the U.S. side (keep in mind those shares may actually delist over the long-term, given accounting rule uncertainties). We have no Chinese stock positions currently, and while I’m hopeful about reform and buying quality companies on dips, I see the sentiment in the charts above pointing to greater values in Europe right now, especially as Europe pulls back from the cliff this year. In January we will look at opportunities in the Eurozone. We launched the Thomson Reuters MarketPsych Indices for monitoring market psychology for 30 currencies, 50 commodities, 120 countries, and 40 equity sectors and industries in social and news media. We have a number of Spring 2013 speaking engagements in New York, London, Toronto, and Boston – we will provide locations and venues as the dates come closer. Speaking of the fiscal cliff - and who isn't these days - MarketPsych has a new digital short film up. It is part of our on-going series for financial advisors featuring Bob, the client, and his intrepid advisor, Helen. Just a little bit of levity as we drift closer to the precipice of financial doom. You have to remember one thing about the will of the people: it wasn't that long ago that we were swept away by the Macarena. Leading group therapy for mentally ill prisoners is never boring. But is it dangerous? Not really. Humorous? Yes, sometimes. Enlightening? Nearly always. In one fascinating group, a mutiny against my leadership was led by a psychologically saavy gang-leader. I bring up this experience because it mirrors the fiscal cliff drama playing out in Washington. While I was confronted by a different league of bully in prison, the techniques I used to regain control of the group may be used in Washington to restore legislative momentum, and if we see them emerge, we will know compromise is near. He went on, “Let’s go guys, we don’t need this, we’re done with this &$#*&@.” He walked out with his fellow group members, staring me down as they filed out of the room. I was left alone, embarrassed and befuddled. After all, I was in fact a well-to-do young doctor from Santa Monica, and the fact that he – a powerful gang leader with an outside network - knew about my personal life was truly disturbing. I needed professional advice about how to handle a situation like that one, so I turned to a wise mentor. Bullies are part of our world. While they are more common in prison, we all come into contact them in our lives, often at important times. You might even say navigating bullies is an essential life skill. The bully in my group therapy session had a long history of paranoia and violence, so it wasn’t too surprising that he acted the way he did in that first session. Fortunately a mentor of mine gave me useful advice on how to negotiate with bullies such as this prisoner. When I used his advice, I regained control of the group and the gang-leader turned out to be a terrific ally. I’ll share the advice later in this letter, but first, we’ve got a few more weeks of bullying to witness at the highest levels of the U.S. Government. After the fiscal cliff comes the debt ceiling negotiations in January, so the drama is likely to continue. First we’ll look at data on how Stress and Uncertainty affect markets. Understanding the negotiating strategies and psychologies of the two parties will give us a sense of how the talks are likely to pan out. And we’ll then review the sentiment trades from our last newsletter and add a couple for this week. As investors, we need to know how the fiscal cliff will affect equity prices. Obviously there are a range of sentiments aroused by the political brinksmanship, so analyzing one sentiment isn’t a perfect proxy. That said, we think our variables Stress and Uncertainty from the Thomson Reuters MarketPsych Indices are a fairly good proxy for what investors are experiencing. As you can see in this dramatic plot of Stress in news reports about the S&P 500 and its constituent companies, Stress (blue line) is at a 12-month high. Social media shows a similar spike in the last month, but it is less dramatic (in social media August was the most stressed month). We performed a quick cross-sectional analysis in which we looked at 40 ETFs tracking the largest indexes, sectors, and industries in North America with high Buzz (lots of chatter) in financial social media over the past 14 years (1998-2012). We sorted those ETFs by the percentage of that chatter that was Stress-related. The past 24 hours of Stress was aggregated to 30 minutes before the close today (t) was matched to the percent return from today’s Close to tomorrow’s Close (t+1). For each Quintile of Stress days – the highest Stress 20% of days is on top and least Stressed 20% is on the bottom – we averaged the one-day forward return of that ETF. The sample included data from 1998-2012 but largely centered on 2008-2012 due to a higher number of ETFs being available for analysis over that period. In the case of Stress, high Stress precedes high return days. In fact, if this Quintile strategy were tradable (assuming unrealistic zero transaction costs, optimal portfolio formation, a lack of overfitting, etc…), we would see over 30% average annual returns. It looks like greater than 50% average annual returns from this strategy, but I want to be clear that THIS IS NOT TRADEABLE as it is. The extreme stress days are better at timing reversals. When many ETFs are hitting extreme stress points at the same time, there tends to be a positive price bounce. This is a specific timing model, not a portfolio rotation-type model. But while we’re at it let's take a look at Uncertainty. With Uncertainty we don’t see high daily returns. To understand how the uncertainty and stress of the fiscal cliff negotiations is likely to resolve, it helps to revisit my negotiations with prison bullies. The bully who challenged me in prison felt he had the moral high ground and that because of my presumed background (rich doctor), I was less than human. He usurped my authority to complete his own agenda – getting more physical and economic power among peers. After my first losing encounter, the wisest psychotherapist I know, who is a mentor of mine, told me how to work with him. I was to hold the group again and invite the bully. According to my mentor, when the group started the bully would again express contempt towards me and attempt to split the group from me, earning him additional political points. My job as therapist was to remain in a curious state of mind and to aggressively and preemptively call out the bully’s behavior. First of all, when the bully denounced me and prepared to walk out, I was to immediately and calmly say, “I think you’re going to leave now.” He couldn’t do what I said he was going to do, as my predicting his behavior undermined his dominance. He would then have to stay in the room to re-establish his dominance before leaving. Then when he said, “you just don’t know anything about our lives!” I would respond, “you’re right, I don’t know how hard it is to be you, so tell me, what’s it like?” When he said, “you’ll never understand,” I was to respond with sincere interest, “Could you help me?” When he looked frustrated, I was to say, “I get that you’re angry, and you want to leave” again preemptively calling out his behavior. As I acknowledged his position, he HAD to respond in order to stay dominant. But as I drilled in further with genuine curiosity, he couldn’t escape. As long as I was persistent, authentic, and didn’t back down, eventually he would be forced to either answer my questions (and thus engage in therapy) or he would be forced to again leave the group but this time but in the weaker position. Our interaction played out exactly as above, and to make a long story short, in that second session he engaged in therapy. Later that week he became the group’s greatest promoter, rounding up all the group members to attend every session thereafter. But this newsletter isn’t about group therapy in prison. 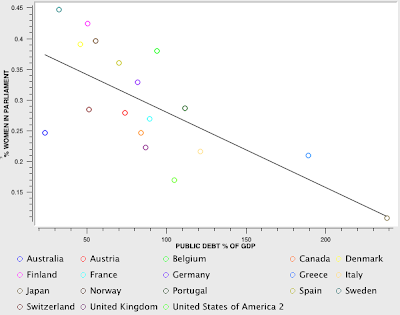 Of greatest relevance is how the fiscal cliff is likely to unfold as two parties of bullies bump heads. What is Likely Outcome of the Cliff? It’s no secret that both political parties feel they have the moral high ground, and they think of their opponents as something less than human. Media hype about the potential catastrophe of failed fiscal cliff negotiations is unlikely to move Democrats and Republicans, because each side essentially has its own media. One might think that a sharp fall in equity or rise in bond markets might get politicians moving. But then, recall that the first financial bailout failed in the House on September 29, 2008, after a severe selloff had already occurred. The Dow subsequently dropped 700 points intraday on September 29, finally spurring compromise. That said, a compromise is likely, but before any compromise is possible, we’re going to see one side in the negotiations aggressively and empathetically calls out the other’s actions (as I did with my bullying gang-leader client). For example, Obama may tell Republicans, “I get that any pain you feel now, you’re going to make up for it in January by blocking me at the debt ceiling talks. As it is now, you’d prefer not to make a deal with me, so we’re going off the cliff.” And Republicans saying, “We understand you’ve got us in a trap, that public opinion is against us, and you’re going to push through a tax increase on the rich at any cost.” For Republicans, this has begun to occur, but is not uniform from their side yet. What is remarkable about this process is that the authentic side will usually win – they will get more of what they want in January. I would say that Obama tried this previously and was rebuffed, but now he is in the position of the group leader, and could get more traction (and have a much easier second term). 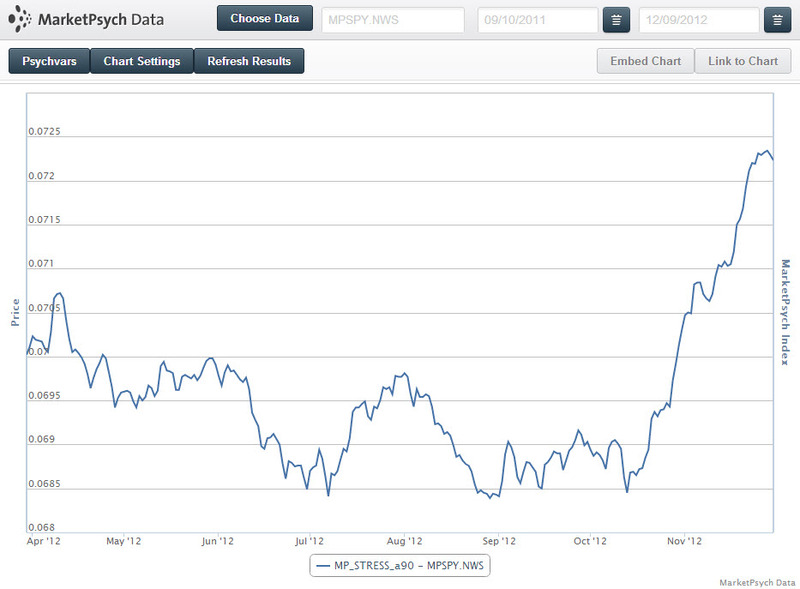 Whatever happens, I suspect the stock market rallies in 2013. Cooperation between the parties would lead to a greater rally, and continued resistance to a lesser one. But my opinion is that the next two months we will see enough Republicans cross the aisle to break the logjam in Washington. Maybe that’s overoptimistic, but if we see that, the equity markets will like it. That said, the overall investor mood is much more pessimistic than mine. The chart below shows the Outlook (Optimism – Pessimism) in social media around stocks in the S&P 500. 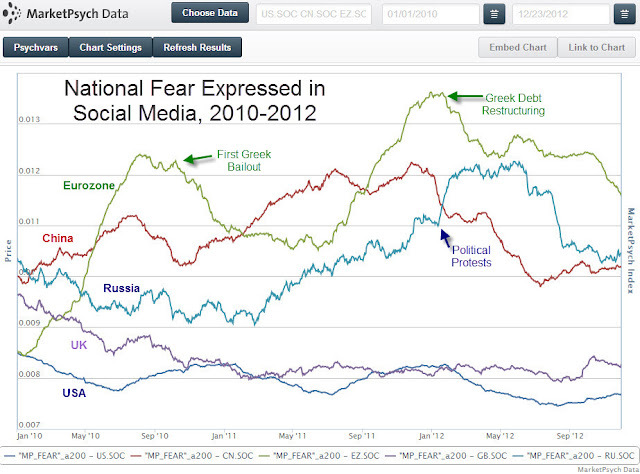 As you can see, the overall pessimism level is near that of 2011. 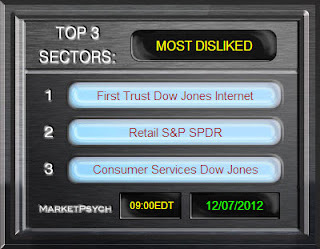 When we look at which industries are the most disliked, we see that retail, consumer services, and internet are on top. It looks like investors are preparing for spending cuts, and these industries will be most adversely impacted by any recession or reduced consumer activity. In fact retail and consumer industries are the ones to buy in case the fiscal cliff looks near resolution (without significant spending cuts). And even if the spending cuts are drastic, the impact looks to be factored in already by investors. How Do I Safely Drive Over the Cliff? The truth is that the fiscal cliff may not be as bad for the markets as hyped in the media. In fact, the U.S. dollar and the bond market may rally if all tax hikes and spending cuts take effect. There are many considerations when preparing for the fiscal cliff, and it’s better to consult a financial advisor about your specific needs. For example, given that capital gains taxes are set to rise, you may want to sell more stocks this year to book the profits both for tax reasons and to avoid any year-end market decline driven by others doing the same thing. But such preparations are very complex and are out of the scope of this newsletter. If you are a financial advisor, please subscribe to our financial advisor newsletter that discusses how to speak with clients to help demystify the cliff. We personally recommend increasing U.S. equity exposure on any fiscal cliff-induced selloff, and we expect that retail stocks will have the biggest bounce after resolution given what we are seeing in social media. Trading recap from last newsletter: Our short on Nokia (NOK) yielded 8% as the stock fell from its short-term high for the week. 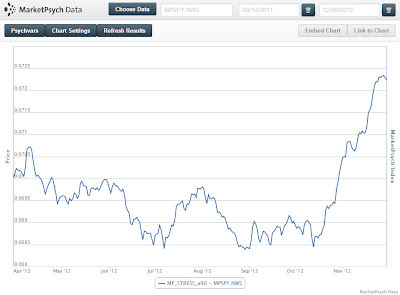 Our buy on Diamond Foods (DMND) was also profitable, as that stock rose 8% over the week. Week ahead: We're seeing a one-week buy on Intel (INTC) with high negativity and a sliding stock price over the past quarter. Fundamentally INTC is a bargain with an 8 P/E and a dividend of 4%. We’re also seeing a one-week buy on Freeport McMoran (FCX) following a large decline after $20 billion in buyout offers were floated this week. The stock is likely to rally slightly as investor opinion turns less negative from the initial reaction (See Disclaimer below). Stay tuned for our yearly forecast at the end of the year, where we profile the most optimistic and pessimistic equities of the year with expected underperformance and outperformance respectively. Our track record looks reasonably good this year with our 2011 picks panning out as expected, such as our short on McDonalds (MCD).